Karin Fossum debuted as a poet with Kanskje i morgen (Maybe Tomorrow) which she published in 1974. For a time she worked in hospitals, nursing homes and assisted with rehabilitation of drug addicts and published more but mostly poetry and short stories. But she finally got into crime writing and wrote the her first Inspector Sejer novel In the Darkness (Evas øye) in 1995. She got her break with her second novel in the series a year later: Don’t Look Back (Se deg ikke tilbake!) won the Glass Key award, and also won the Riverton Prize. With Inspector Sejer becoming a mature series, more of her books were translated into English and in 2005, she was shortlisted for the Crime Writers’ Association Gold Dagger for Calling Out For You (The Indian Bride in the U.S.). Inspector Konrad Sejer, the hero of most of Karin Fossum books, is a character unlike other Scandinavian noir novels. While we see in characters such as Wallander, a troubled man who is struggling with family issues, alcohol or illness besides the case work, Sejer is much more calmer, in control and polite. All of Inspector Sejer books are now available in English which is a very delightful thing for readers who want to read the whole series. Below you can find the this series books and their brief synopsis in order. In the Darkness (Evas øye, 1995). Eva is walking by the river one afternoon when a body floats to the surface of the icy water. She tells her daughter to wait patiently while she calls the police, but when she reaches the phone box Eva dials another number altogether. The dead man, Egil, has been missing for months, and it doesn’t take long for Inspector Sejer and his team to establish that he was the victim of a very violent killer. But the trail has gone cold. It’s as puzzling as another unsolved case on Sejer’s desk: the murder of a prostitute who was found dead just before Egil went missing. While Sejer is trying to piece together the fragments of a seemingly impossible case, Eva gets a phone call late one night. A stranger speaks and then swiftly hangs up. Eva looks out into the darkness and listens. All is quiet. What is Eva’s secret? Don’t Look Back (Se deg ikke tilbake!, 1996). Beneath the imposing Kollen Mountain lies a small village where the children run in and out of one another’s houses and play unafraid in the streets. But when a naked body is found by the lake at the top of the mountain, its seeming tranquility is disturbed forever. Inspector Sejer starts the process to investigate. As the suspense builds, and the list of suspects grows, Sejer’s determination to discover the truth leads him to peel away layer upon layer of distrust and lies in this tiny community where apparently normal family ties hide dark secrets. He Who Fears the Wolf (Den som frykter ulven, 1997). Inspector Sejer is hard at work again, investigating the murder of a woman who lived alone in the middle of the woods. The chief suspect is another loner, a schizophrenic recently escaped from a mental institution. The only witness is a twelve-year-old boy, overweight, and a resident at a home for delinquents. When a demented man robs a nearby bank and accidentally takes the suspect hostage, the three misfits shape an uneasy alliance. Shrewdly, patiently, as is his way, Inspector Sejer confronts a case with some strange criminals. When the Devil Holds the Candle (Djevelen holder lyset, 1998). When two teenagers steal a purse from a stroller, it results in an infant’s death. Unaware of the enormity of their crime, Zipp and Andreas are intent on committing another. They follow an elderly woman home, and Andreas enters her house with his switchblade. In the dark, Zipp waits for his friend to come out. Inspector Sejer and his colleague Jacob Skarre see no connection between the infant’s death and the reported disappearance of a local delinquent. And so while the confusion outside mounts, the heart-stopping truth unfolds inside the old woman’s home. Unflappable as ever, Sejer digs below the surface of small- town tranquility in an effort to understand how and why violence destroys everyday lives. The Indian Bride (Elskede Poona, 2000). This book is available in the UK as Calling Out for You. When long-time bachelor Gunder Jomann goes to India for two weeks and comes home married, the town of Elvestad is stunned. Then, on the day his bride is supposed to arrive, the battered body of a woman is found on the outskirts of town. The “good people of Elvestad” can’t believe that anyone among them could be capable of such a crime. But in his quiet way, Inspector Konrad Sejer understands that no one is completely innocent—not the café owner who knows too much, the girl who wants the attention that comes with being a witness, or the bodybuilder with no outlet for his terrible strength. Black Seconds (Svarte sekunder, 2002). Ida Joner gets on her brand-new bike and sets off toward town. A good-natured, happy girl, she is looking forward to her tenth birthday. Thirty-five minutes after Ida should have come home, her mother starts to worry. She phones store owners, Ida’s friends, anyone who could have seen her. But no one has. Suspicion immediately falls on Emil Mork, a local character who lives alone and hasn’t spoken since childhood. His mother insists on cleaning his house weekly—although she’s sometimes afraid of what she might find there. A mother’s worst nightmare in either case: to lose a child or to think a child capable of murder. As Ida’s relatives reach the breaking point and the media frenzy surrounding the case begins, Inspector Konrad Sejer is his usual calm and reassuring self. But he feels puzzled. And disturbed. This is one of his strangest cases in years. The Murder of Harriet Krohn (Drapet på Harriet Krohn, 2004). Charlo Torp, a newly recovered gambler, makes his way through the slush to Harriet Krohn’s apartment, flowers in hand. Determined to pay off his debts, Charlo plans to steal the old woman’s antique silver collection. But he didn’t expect her to put up a fight. The following morning, Inspector Sejer goes to the scene to investigate. Harriet is dead, her silver missing, and the only clue in the apartment is an abandoned bouquet. When Charlo sees the news, he knows he should feel relieved, but he knows about Sejer’s amazing record — the detective has solved every case he’s ever been assigned to. The Water’s Edge (Den som elsker noe annet, 2007). Reinhardt and Kristine Ris, a married couple, are out for a Sunday walk when they discover the body of a boy and see the figure of a man limping away. They alert the police, but not before Reinhardt, to Kristine’s horror, kneels down and takes photographs of the dead child with his cell phone. Inspectors Konrad Sejer and Jakob Skarre begin to make inquiries in the little town of Huseby. But then another boy disappears, and an explanation seems more remote than ever. Meanwhile, the Rises’ marriage unravels as Reinhardt becomes obsessed with the tragic events and his own part in them. Bad Intentions (Den onde viljen, 2008). In this chilling story Inspector Sejer must face down his memories and fears as he investigates the deaths of two troubled young men. The first victim, Jon Moreno, was getting better after a mysterious guilt had driven him to a nervous breakdown one year earlier. His psychiatrist said so, as did his new friend at the hospital, Molly Gram, with her little-girl-lost looks. So when he drowns in Dead Water Lake, Sejer hesitates to call it a suicide. Then the corpse of another young man is found, a Vietnamese immigrant. And Sejer begins to feel his age weigh on him. Does he still have the strength to pursue the elusive explanations for human evil? The Caller (Varsleren, 2009). One mild summer evening, a young couple are enjoying dinner while their daughter sleeps peacefully in her stroller under a tree. When her mother steps outside she encounters something stunning: The child is covered in blood. Inspector Sejer goes to the hospital to meet the family. Mercifully, the child is fine, but the parents are very nervous. Sejer spends the evening trying to understand why anyone would carry out such a sinister prank. Then, just before midnight, somebody rings his doorbell. No one is at the door, but the caller has left a small gray envelope on Sejer’s mat. From his living room window, the inspector watches a figure disappear into the darkness. Inside the envelope Sejer finds a postcard bearing a short message: Hell begins now. The Drowned Boy (Carmen Zita og døden, 2013). Carmen and Nicolai failed to resuscitate their son, Tommy, after finding him floating in their backyard pond. When Inspector Skarre arrives on the scene, Carmen reports that Tommy, a healthy toddler with Down syndrome, wandered into the garden while Nicolai was working in the basement and she was cleaning the house. Skarre senses something is not right with Carmen’s story and consults his trusted colleague, the famed Inspector Sejer. An autopsy reveals Tommy’s lungs to be full of soap. When Sejer and Skarre revisit the couple, Carmen, an epileptic, changes her story, confessing that she’d been knocked unconscious by a seizure while bathing Tommy. When she came to, she found him drowned in the tub and, horrified and frightened, threw him into the pond. But Skarre and Sejer’s doubt is not appeased and the case is reopened. What more could Carmen be hiding? And what lengths will she take to cover her guilt? As Carmen’s own family starts to doubt her, Skarre and Sejer work to find the truth. Hellfire (Helvetesilden, 2014). A gruesome tableau awaits Inspector Konrad Sejer in the oppressive summer heat: a woman and a young boy lay dead in a pool of blood near a dank camper. The details of the deaths of Bonnie Hayden and her five-year-old son Simon are mysterious. There is no sign of robbery or assault. Who would brutally stab a defenseless woman and her child? Sejer and his fellow investigator Jakob Skarre begin a hunt for the killer that will eventually lead them to a heartbreaking conclusion. In a parallel storyline, masterfully fused, Fossum tells the story of Mass Malthe and her troubled son Eddie as they navigate a relationship that some would call too close. Eddie constantly thinks about his unknown father — someone his mother would rather forget. But when he gets to the bottom of it, he realizes that Mass and Bonnie share more in common than he could have ever guessed. Karin Fossum has a number of other books and writings which consist of poetry, short stories and novels. Only few of such non-Sejer titles are available in English. 2013 – Broken (Brudd, 2006); English translation 2008. A woman wakes up in the middle of the night. A strange man is in her bedroom. She lies there in silence, paralyzed with fear. The woman is an author and the man one of her characters, one in a long line that waits in her driveway for the time when she’ll tell their stories. He is so desperate that he has resorted to breaking into her house and demanding that she begin. The author decides, that he is named Alvar Eide, forty-two years old, single,works in a gallery. He lives a quiet, orderly life and likes it that way—no demands, no unpleasantness. Until one icy winter day when a young drug addict, skinny and fragile, walks into the gallery. Alvar gives her a cup of coffee to warm her up. And then one day she appears on his doorstep. 2015 – I Can See in the Dark (Jeg kan se i mørket, 2011). Riktor doesn’t like the way the policeman storms into his home without even knocking. He doesn’t like the arrogant way he walks around the house, taking note of its contents. The policeman doesn’t bother to explain why he’s there, and Riktor is too afraid to ask. He knows he’s guilty of a terrible crime and he’s sure the policeman is there to arrest him. But when the policeman finally does arrest him, it’s for something totally unexpected. Riktor doesn’t have a clear conscience, but he certainly didn’t commit the crime that policeman has accused him of. Imprisoned and desperate to break out, he fights to clear his name without further incriminating himself, in a gripping standalone novel from. 2012 – Natten er et annet land – poetry (The Night is Another Land). Timeshift (TV Series documentary, 2010) – Nordic Noir: The Story of Scandinavian Crime Fiction. This is a documentary film by Robert Murphy which investigates the success of Scandinavian crime fiction and why it exerts such a powerful hold on our imagination. You can watch a YouTube version of this film below. Crime Diary (TV Movie documentary, 2008). 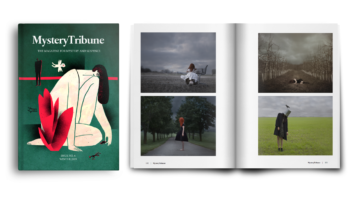 With the firm belief that "behind extraordinary mystery books or pieces of art, there are extraordinary people", we search the globe to bring you the most captivating work from both established authors and creatives as well as emerging talents. We usually send an email once or twice a month, with updates on our new stories and projects.